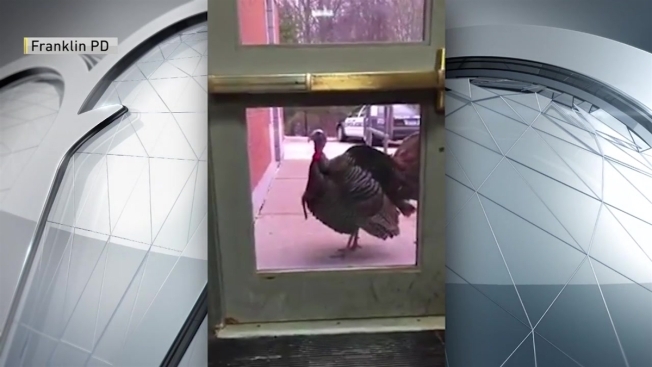 Video of a giant turkey trying to escape Thanksgiving during its visit to a Massachusetts police department is going viral. Video of a giant turkey trying to escape the Thanksgiving dinner table during a visit to a Massachusetts police department is going viral. Police in Franklin posted the video of the turkey pecking at a police department glass door window to the department on Tuesday. "Sorry Tom, breaking into the police station won't save you," Franklin police tweeted, adding on Facebook, "Try the Franklin Fire Department." The video has racked up more than 12,000 views on Twitter and more than 14,000 on Facebook.